← Who cut the rope? On Easter Saturday my daughter and I visited the HQ of Alpine BASE jumping, the Airtime café in Lauterbrunnen, to meet the American skier and jumper JT Holmes. We were on our way home after a week of skiing in bad weather in Mürren. I recognised JT from the lift queue the previous day, jostling for position in the minutes before the Birg cable car opened after a frustrating week of intermittent snowfall and extreme avalanche danger. Good Friday? No, excellent. JT had spent the morning skiing powder on Mürren’s lower slopes and the afternoon speed-riding on the upper mountain, kissing the steep snowfield beneath the cable car with a few pretty turns between cliff jumps; with a BASE jump from Mürren to Stechelberg to round off the day – so much more fun than going down by train, and quicker too. A village perched on a cliff is JT’s idea of the perfect ski resort. “The Alpenruh is 50 yards from the cable car, so I can do a BASE jump and come back up for breakfast,” he says. While JT discussed logistics with a local Swiss about getting a helicopter to drop him on top of the Eiger for his next adventure, I picked up a well-thumbed BASE jumping manual which was attached to the wall by a piece of string and fell open at a chapter entitled ‘what to do if ….’. The section subtitled ‘…. your parachute fails to open’ was quite short. The forecast was set fair, and JT talked me through what he had in mind for later in the week. First up, speed-ride the Eiger’s West Face, skiing the steep snowfields and flying over rock bands as far as the Geneva Pillar, otherwise known as the Eiger Mushroom or Magic Mushroom. This is a precarious looking buttress with a bulbous cap tied to the west ridge by a cable known as a Tyrolean. 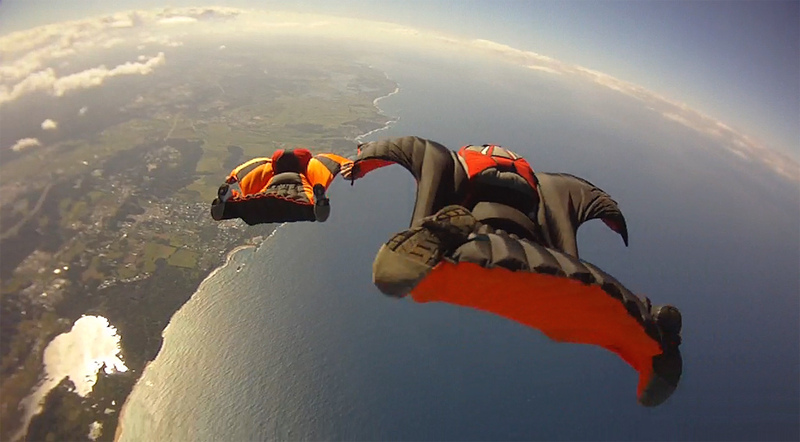 The Tyrolean is not there to hold the mushroom cap in place, but to allow BASE jumpers to clip on and zip across from the ridge, jump off and dive down the North Face or ‘track’ across it using a wingsuit which transforms a straight plummet into a more sophisticated and manoeuvrable and much longer glide – a flight, in fact. 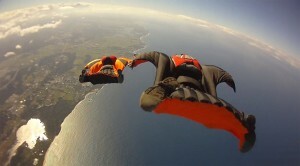 BASE jumping in a wingsuit is called WiSBASE jumping. And in case you are wondering why BASE jumping requires block capitals, as I was, the reason is that BASE is an acronym for the different kinds of eligible launch point: Building, Antenna, Span, Earth. Anything But An Aeroplane would be another way to express it, but less catchy. The Eiger Mushroom is an example of the Earth category along with Mürren and ‘all the cliffs you can see up there’ said JT, with an expansive wave. The Lauterbrunnen valley counts more than 20,000 BASE jumps a year and, yes, it has got to the point where you sometimes have to queue. The speed-riding part of the Eiger project has been done before (see Youtube) and on any fine, calm summer’s day the flying squirrels will be up there on the Eiger’s high diving board, preparing to take the plunge. The tricky part is the transition: you can’t ‘track’ with skis attached, so the ski gear must be jettisoned in mid-air. This obviously poses a risk to anyone under the flight path and is hardly the most eco-friendly way to treat the mountain environment. “We’ll pick it all up,” JT said quickly, anticipating these objections. Then there’s the clothing: is it possible to speed-ride in a wingsuit, or does the skiWiSBASE jumper have to perform a costume change in mid-air? The exploit is only half the job: the key to success lies in the camera work and this needs almost as much planning as the jump itself. “My cameraman is another speed-rider,” JT explained. “With his chute he descends faster than me, so he’ll overtake and spin around me on the way down,” like two ravens at play. Not wishing to get bogged down in the detail, the question we earthlings always ask at this point is, why? Well, making films of stunts like this, for their own sake or for exciting action sequences in feature films, is JT’s living. He also happens to enjoy it. “My favourite things for fun are skiing and flying,” he says simply, so it’s quite obvious really. The mountains are full of beautiful slopes we would all love to ski, if only they didn’t end at a cliff edge. 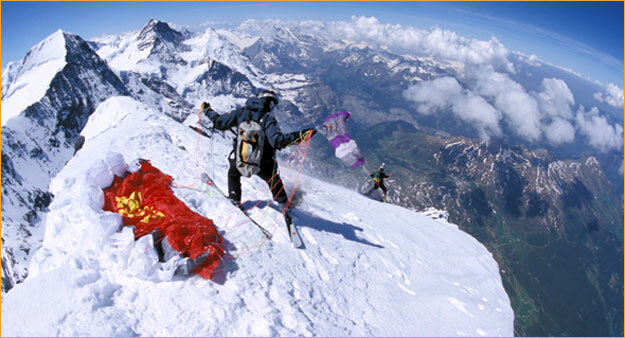 Acquire BASE jumping or speed-riding skills, or both, and it all opens up: all-mountain skiing becomes reality. Many people shake their heads, say Hubris, and find it all beyond comprehension. I am not of that persuasion, having tried speed riding for a day and felt for myself the thrill of lift-off and brief moments of airtime. One more day, and I would have been ready to try a steeper slope with an obstacle to clear; a small cliff perhaps, with a soft landing, just in case. And so it would go on, in small steps. It’s about the desire to fly, which is as old as myth. JT is from San Francisco but moved to a Squaw Valley ski academy in his teens. 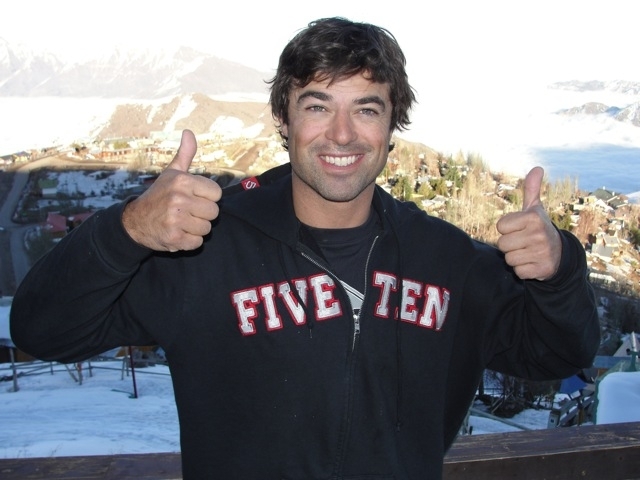 Recognising that he was not champion material in ‘conventional’ branches of skiing, he took up jumping with the one of the leading lights of the game, Shane McConkey, as his mentor, and has made his living from skiing since he was 17 – that is, the better part of two decades. Not bad, compared with a ski racing career. As lunacy goes, learning to glide like Batman, Superman and Birdman has obvious commercial applications. Of course he has been in a few scrapes. A broken arm last year after a bad landing. 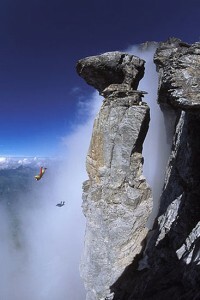 A huge ‘22-tomahawk’ fall in the Bec des Rosses Xtreme competition in 2010. Most famously, JT was the wingman, if that’s the right word, in the Dolomites in 2009 when one of McConkey’s skis failed to release and sent him into a fatal spin. JT identified half a dozen ‘variables’ – things that can go wrong – where improvements could be made: ‘technical things’ about the equipment, the plan and the location. Looking at extreme sports from the outside, we tend to focus on danger and death. Extreme sports may be risky, but taking risk is not the point of them. The point, in this case, is to fly. JT and friends are not in denial about risk. They spend long days assessing and calculating it with great precision, and finding elaborate ways to reduce it. I am struck by the way JT expresses himself. What he does is not a career or a job, but “a living.” When his parents threatened to remove him from Squaw Valley to complete his education in an urban High School, this was “a death sentence.” Extreme sports are not about flirting with death, but connecting with life. My daughter and I set off on our long drive home and, sensing that ‘good luck’ would not be appropriate, wished JT a beautiful flight and a successful outcome. Our fingers were aching from being crossed for nearly a week before an email came through. “Pulled it off!” was all it said. We’re looking forward to the movie.